Push notifications let your Android application notify a user of an event, even when the user is not using your app. The goal of this tutorial is to send a simple push notification to your app. We'll use Ubuntu 14.04 and Python 2.7 on the server, and Google Cloud Messaging as the push notification service. We'll use the term server to refer to the instance spun up with DigitalOcean. We'll use GCM to refer to Google's server, the one that is between the Android device and your server. 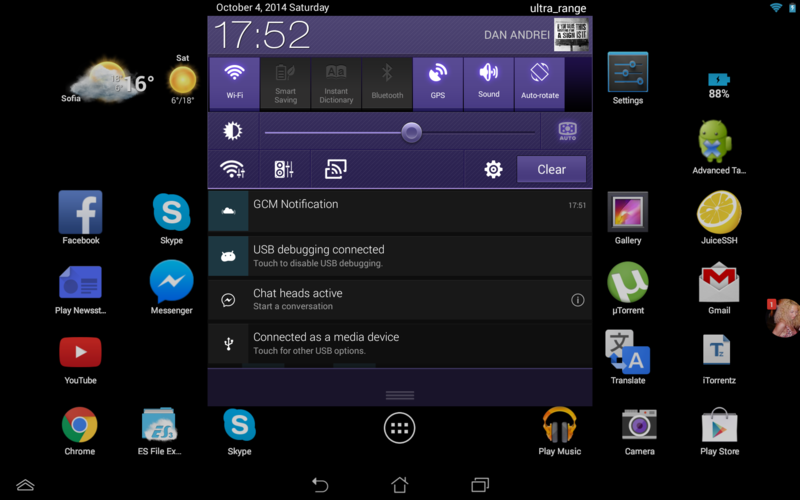 Google-provided GCM Connection Servers take messages from a third-party application server, such as your Droplet, and send these messages to a GCM-enabled Android application (the client app) running on a device. Currently, Google provides connection servers for HTTP and XMPP. In other words, you need your own server to communicate with Google's server in order to send the notifications. Your server sends a message to a GCM (Google Cloud Messaging) Connection Server, then the connection server queues and stores the message, and then sends it to the Android device when the device is online. We need to create a Google API project to enable GCM for our app. Visit the Google Developers Console. If you've never created a developer account there, you may need to fill out a few details. Enter a project name, then click Create. Wait a few seconds for the new project to be created. Then, view your Project ID and Project Number on the upper left of the project page. Make a note of the Project Number. You'll use it in your Android app client. 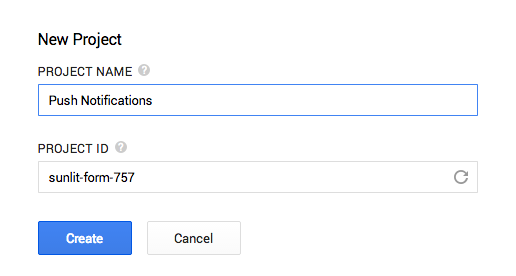 Make sure your project is still selected in the Google Developers Console. In the sidebar on the left, select APIs & auth. In the displayed list of APIs, turn the Google Cloud Messaging for Android toggle to ON. Accept the terms of service. Google Cloud Messaging for Android should now be in the list of enabled APIs for this project. 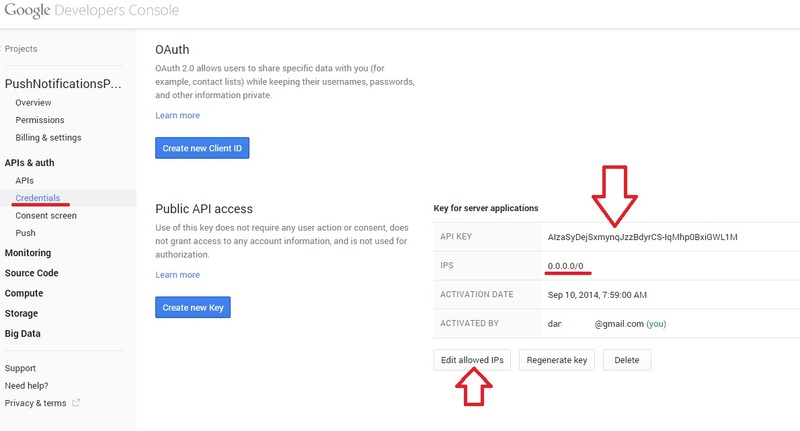 Under Public API access, click Create new Key. Enter your server's IP address. Copy the API KEY. You'll need to enter this on your server later. To test the notifications, we need to link our Android app to the Google API project that we made. If you are new to Android app development, you may want to follow the official guide for Implementing GCM Client. You can get the official source code from the gcm page. Replace this with the Project Number from your Google API project. Deploy a fresh Ubuntu 14.04 server. We need this to be our third-party application server. Google's GCM Connection Servers take messages from a third-party application server (our Droplet) and send them to applications on Android devices. While Google provides Connection Servers for HTTP and CCS (XMPP), we're focusing on HTTP for this tutorial. The HTTP server is downstream only: cloud-to-device. This means you can only send messages from the server to the devices. The client will communicate with your server by sending the registration ID of the device for you to store it and use it when you send the notification. Don't worry now about managing it; it's very simple and GCM provides you with help by giving you error messages in case a registration ID is invalid. Log in to your server with a sudo user. Install python-gcm. Find out more about python-gcm here. Add the following information to the file. Replace the variables marked in red. The explanation is below. Wait about 10 seconds. You should get a notification on your Android device. Is your smartphone/tablet connected to the internet? Do you have the correct project key? Do you have the correct regid from the app? 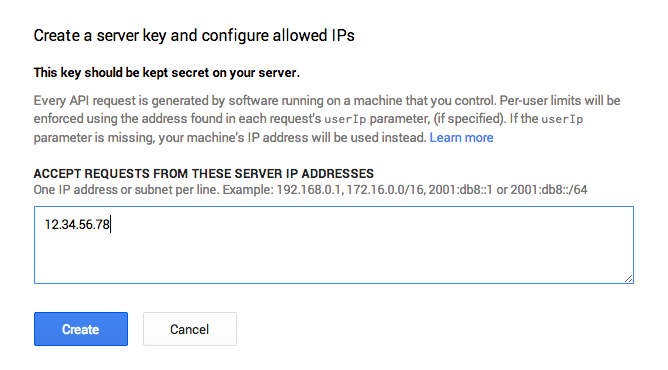 Is your server's IP address added for the Google API server key? Is the server connected to the internet? If you're still not getting the notification, it's probably the app. Check the logcat for some errors. Once you've done this simple test, you'll probably want to send the notifications to all your users. Remember that you have to send them in sets of 1000. Also, if the CGM responds with "invalid ID," you must remove it from your database. You can adapt the examples in this tutorial to work with your own Android application.